Cartago, Costa Rica P. Raulino Reitz, Dir. A blooming specimen of Vriesea ororiensis, collected in Costa Rica by the artist last winter. Sheaths are gray, leaves green with fine wavy cross lines throughout. A reddish color shows in the leaves of some specimens, others are all green. The bracts are bright red, with pale green sepals and yellow petals. The plant shown is about one third full size, but there were others much smaller in bloom at the same time. at an elevation of 9000 feet. Costa Rica has been called the Herbarium of Central America, with its consistently mild climate and a wealth of botanical species of many of the world's plant families. A narrow strip of land between two oceans, its mountains and valleys are constantly bathed in moist cloud mists, producing a rich flora and a complete absence of any desert areas. More species of trees grow there than in any country of comparable size in the world. And when the facts are all known, there are probably more species of the Bromeliaceae growing there than Carlos Wercklé even suspected. It was a great surprise to find myself on one of the Rolls-Royce planes of TACA air lines, heading south toward the tropics. 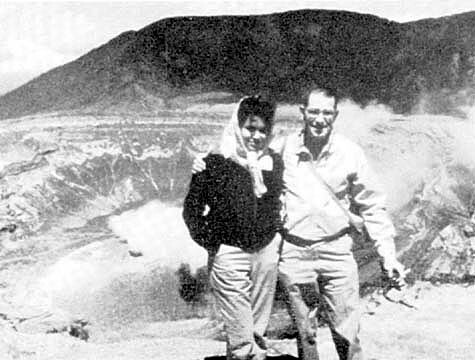 Our good friends, Mr. and Mrs. E. T. Melvin, of Portland, Oregon, were visiting us in New Orleans last winter, previous to spending some time in Costa Rica early in 1961. They had visited there several years previously, spending part of their time with a native family, one of whose members had lived with them for a time in Oregon. Their enthusiasm for the beauty of the mountains and valleys, the excellent food, the good, if narrow, country roads, and the fine and lovable qualities of the "Ticos", as the native Costa Ricans call themselves, all told a story of a country well worth visiting. They finally persuaded me to go with them for a short trip, just to get acquainted with the country. And later I had to admit that all their stories were definite understatements. When our plane landed, and we were through the customs, we were immediately surrounded by a group of eight or ten members of the family who knew the Melvins. They embraced us all, even me, the extrangero, like members of the family back from a trip. Two carloads, including our luggage, took off for the town of Alajuela, not far from the airport, where we were to make our headquarters. The warmth and friendliness of these people was overwhelming, and a complete surprise to me, although before I left I realized this was typical of the natives of the country. We were at their home in a few moments, where a real "homecoming party" was staged, with the aid of both food and wine. They kept us for dinner, and it was late that evening before we arrived at the "Pension" operated by Mr. and Mrs. Jensen, where we had made reservations. During the next few days we collected bromeliads in a number of places in the Central Plateau, some at high elevations, others in isolated valleys where the clouds hung low and shrouded the land with a thick blue mist There were trees fairly loaded with large clusters of Tillandsia tricolor var. melanocrater, some of them in bloom, while in other spots Tillandsia caput-medusae was more in evidence. 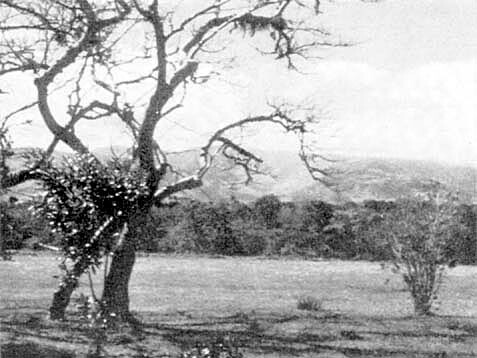 In all the towns the plazas contained large, ancient trees, many of which supported their full share of bromeliads which no one ever collected. In one tree we saw several huge clumps of Aechmea mariae reginae, although they were not in bloom. Many unknown Tillandsias were found, which will have to remain so until they show an inflorescence. That we were able to cover so much territory in such a short time was largely due to the intelligent planning and generous assistance of Señor Enrique Castro, Director of Personnel at the University of Costa Rica, and other members of his family. He is a member of the Bromeliad Society, and is not only well acquainted with the various genera of the bromeliads, but knows where they may be found. He planned our collecting trips, and when his work at the University kept him from going with us, other members of his family, including his sister Mary and his brothers Bernardo and Juan made trips with us to places previously arranged. A family friend, Ernaldo Lazo, also went with us on some of the trips, as he also is interested in bromeliads. In this way we were able to collect in a wide variety of locations and bring in a good sampling of the available plants. With more time at our disposal, we would probably have found many more species, as many of the areas in the mountains are still as wild and untouched as when Wercklé collected there. We did find a new spotted variety of Tillandsia leiboldiana, now named var. 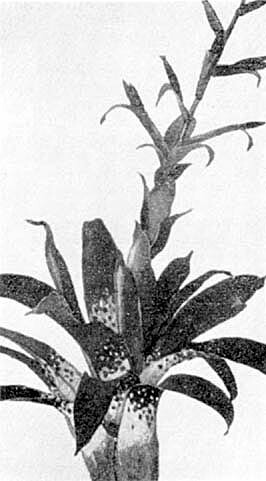 "guttata", which was described and illustrated in the May-June issue of the Bromeliad Society Bulletin for 1961. Typical upland meadow in the Meseta Central, with the mountains in the distance. The tree was host to great numbers of Tillandsia tricolor var. melanocrater. Inflorescence of Vriesea ororiensis, photographed in the mountains near Poas volcano. The Central Plateau, or Meseta Central, in which most of the principal cities, including the capital, San José, are located, is a pleasant rolling valley averaging 3000 feet above sea level, in which three-fourths of the population live. The year-round climate is comparable to summer in one of our New England states, with daytime temperatures of 75 to 80° F., dropping to around 60 during the nights. Since the country is but a narrow isthmus between the Pacific ocean on one side and the Caribbean sea on the other, there is constant air movement from one side or the other, and the high mountains which ring the valley are bathed daily in dripping cloud mists, even during the dry season, usually from November to April. On both sides, beyond the mountains, the land drops gradually down to sea level, with a very definite change in the flora and fauna, as well as the lives and occupations of the natives. Scattered among the mountains are a number of inactive volcanoes, some of which still send up continuous plumes of vapor and gases, indicating a subterranean activity that may at some time again become violent. The land around these old craters is naked of vegetation, but elsewhere the trees and shrubbery extend up and over the mountain tops, producing a lovely rolling panorama of green summits, usually bathed in clouds. The sunsets over the mountains were something to look forward to seeing, each day different from the one before, but all dramatically beautiful. Practically every tree in the mountains, particularly the old patriarchs whose branches might cover an acre of land, are hosts to thousands of epiphytes of all description, bromeliads numerically outranking all other types. Orchids were probably more noticeable in the past, but the collectors have thinned them out to a point where certain species are almost extinct. Even small bushes, and the "living fence posts" along the roads, are often covered with clumps of Catopsis, Vrieseas, and Tillandsias, and, occasionally a few Guzmanias are seen. A species of Bromelia is used for fencing off land from the roads, and with the assistance of one or two loose strands of barbed wire produces an impenetrable barrier to animal or man. In areas high in the mountains, where the trees are bathed daily in wet cloud mists, they are often thickly overgrown with moss, out of which clusters of orchids and bromeliads appear. Even the ground is thickly bedded with moss, and on a sunny day these inviting pads were an, invitation to rest. I soon found they were soaking wet when I accepted the invitation to sit down on one. Up among the rolling green summits of the mountains which surround the central valley. Every tree was loaded with epiphytes, most of them bromeliads. Fortunately for those of us who are interested in the wild and unspoiled aspect of nature, the people of Costa Rica have been slow in building roads to the higher parts of the mountains. The terrain is difficult, and the number of large trees makes road building a slow and costly procedure. While on the trip up one of the slopes I was told that the road, which is still under construction to the rim of the crater of Poas volcano, had been open to traffic for only three months, and the last eight miles or so was little more than a bulldozed cut, which could be negotiated only by a rugged short wheel-base car like the "Jeep" or "Volkswagen". Before that, it was necessary to walk the last ten miles, or make arrangements at a nearby finca to rent horses for the trip. So it was almost virgin territory for bromeliad collecting, and we made the most of it, bringing back boxes full of some of the lovely Vrieseas found near the summit, at an elevation of 8500 feet. Here we saw for the first time the beautiful erect scarlet inflorescences of hundreds of specimens of Vriesea ororiensis, rising a foot or more above the large leaves heavily barred with red pencil-like markings. They were everywhere around us, some perched contentedly on tree branches forty feet high, others in shrubbery hardly higher than our heads, and thousands of small seedlings, sometimes so thick on small twigs as to conceal them completely. A number of apparently different species were collected here, most of them juvenile. After being in cultivation for four months, several are showing signs of the start of an inflorescence. Photo credit M. H. Hobbs. A fragment of a water color drawing of Tillandsia Leiboldiana var. guttata made in the field, and from which the cover drawing of the May-June bulletin was designed. Unfortunately we did not manage to see Mr. Charles Lankester while there, but heard rumors at the time that he was soon to be Knighted by Queen Elizabeth for his work in the horticulture of Costa Rica. From his experience in collecting the Vrieseas of the Thecophyllum type, we knew that these mountain species would not retain the rich coloration of the leaves when brought down to levels lower than their habitat; so I went prepared, and made a number of water color drawings of several species soon after they were collected. It was well that I did, for they have since faded to a pale green, although they still retain the characteristic pencil-like markings across the leaves. Later we went to a rare and unusual spot, a low valley almost completely surrounded by mountains, where the character of the plants indicated a condition of almost constant moisture from the cloud mists which drifted through the valley. 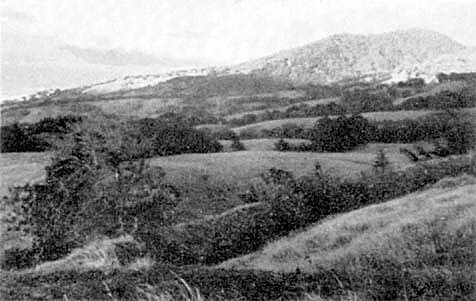 This was Orosi, called the "Valle Encantado", and was one of several places that made me say, "I must come here again". It was there we found the beautiful red spotted variety of Tillandsia leiboldiana, and even there it was confined to a small area, in a few low trees. These, too, have lost their rich, dark maroon color, but many of them have bloomed in cultivation. We visited the little Spanish mission church at Orosi, the first church built by the Spanish Missionaries nearly 400 years ago, and not far away is the legendary "Bridal Waterfall" nearly 300 feet high. A day or two before my return we moved to the Plaza Hotel, in the center of San José, operated by a Texas couple, Mr. and Mrs. Clyde Low. We found the capital a clean, beautiful city, filled with fine, modern stores and shops, displaying merchandise from all parts of the world. At the busy street intersections I enjoyed watching the young, well-disciplined members of the Costa Rican Army handle the heavy automobile traffic well and efficiently, with a minimum of hand and arm movements that could be profitably studied by our traffic cops. Few beggars were visible, and the people on the streets were not only well dressed, but looked well and happy. A large percentage of the girls and women are unusually beautiful, with an occasional redhead or blond sonority among the dark-haired types. A veritable "Land of Beauty", and the millions of bromeliads are beautiful too. Hasta Luego! 628 Toulouse St., New Orleans 16, Louisiana. Some time ago Racine Foster called my attention to references to two supposed bromeliad fossils, Bromelia tenuifolia Lesquereux from Kansas and Bromelia gaudinii Heer from Switzerland. 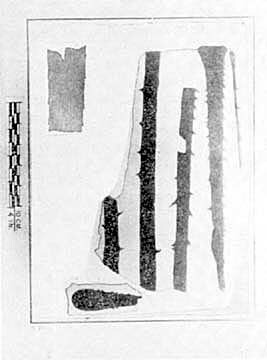 As can be seen from the illustrations, the specimens are sterile and fragmentary. In evaluating such difficult material, I should like to lay the evidence before the members of the Bromeliad Society and use their combined experience not only with bromeliads but with all plants that these fossils might be. In all probability it is impossible to identify either specimen with any living species since they are from the Tertiary, but we can ask if the characters which they display are to be found in the Bromeliaceae, and if not, where. On the other hand, if the fossils appear to be Bromeliaceae, the question is should they be placed in Bromelia or in some other genus. The fact that both were found outside the present range of bromeliads need not concern us, since it is well known that climates varied greatly in the past, even to the occurrence of palms in Greenland. Strictly on morphological evidence then, is Bromelia tenuifolia a bromeliad? I believe not. Lesquereux says: "As in the leaf of Encephalartos the nerves nearest to the borders enter them and pass out, forming short acute teeth or spines turned upwards." In other words, the nerves are truly parallel and when they meet the converging margin they stop. So far as I know, all bromeliads have the nerves convergent, but so gradually that they appear parallel in a small section of a long narrow leaf. The Encephalartos which Lesquereux cites is much more appropriate for the fossil than any bromeliad, but has the objection of being African. However, another cycad, Zamia loddigesii var. angustifolia from Mexico provides an almost perfect match for Bromelia tenuifolia. I wonder if anyone can make a similar comparison or cite a bromeliad with truly parallel nerves? The material of Bromelia gaudinii is much more plentiful than that of B. tenuifolia and consequently one might think that it would be easier to reach a conclusion on its identity. However, it lacks detail and Heer says of the nervation only that it is obscure ("verwischt"), so we are denied that line of evidence that was so helpful in the first species. 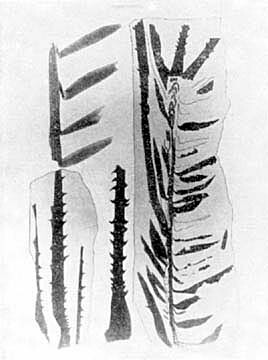 Heer admits the resemblance of the leaves to palm petioles but argues that the fossil remains are too thin to be those. I cannot find any definite evidence to exclude this fossil from the Bromeliaceae, nor do I feel sure that it belongs there. Leaves closely resembling it occur in a number of bromeliad genera especially Bromelia and Puya. If one accepts this fossil as a bromeliad it seems much more probable that it would belong to a morphologically simple and presumably primitive genus like Puya than to a highly advanced one like Bromelia. If the fossils from Switzerland are really bromeliads then the family goes back to some time in the Tertiary. The time elapsed since the Tertiary has been estimated at 70 million years so bromeliads could be that old. The records of palms are definite for that period and morphologically they seem much more complex and therefore younger than bromeliads. Bromelia tenuifolia Lesquereux, U. S. Geological Survey Monograph 17: 41, pl. 1, fig. 13. 1892. Bromelia gaudinii Heer, Flora Tertiaria Helvetiae 1: 107, pl. 49, 50. 1854. Smithsonian Institution, Washington, D. C.
Here in Florida many bromeliad enthusiasts can attest to a remarkable increase in interest by the general public in bromeliads. For instance, within the past year two large nurserymen have issued special listings of bromeliads. These people, purely for business reasons, are now catering to public interest in these plants. At all shows many bromeliads, in individual entries or in mass groupings, may be seen. Thus a very great many of the hundreds of thousands who visit Florida every year also become acquainted with bromeliads, especially if they visit such places as the Everglades where guides point out the "air-plants." This means, of course, that many more persons are today interested enough to acquire one or more bromeliads for their own pleasure and enjoyment. The beauty of the plants, among such people, is frequently asserted as promoting the desire for possession as much as the unusual nature of bromeliads. This, then, leads to the need for pointing out that the beauty of these plants, as seen when on display in large collections or at any of the shows, can be attained in your own home whether you have several or many plants. However, it also means that, since bromeliads are still among the unusual in plant collections, they should always be maintained in a show-worthy condition and actually be "on display" at all times for all to admire. Bromeliads are unlike those plants that must be in bloom to be show-worthy. They are beautiful and interesting plants from early growth to the mature stage, and an eventual bloom is merely an added attraction. As with other plants, though, you cannot expect to have quality bromeliads without some sort of care, and like violets, ferns, roses, and others, their own special needs must be met. Bromeliads are plants that will fit into conditions in and around the home, and amazingly, they do adapt themselves within reason to most places assigned to them. In the Bromeliad Society Cultural Handbook, page 7, is this statement: "Not even excepting the cactus family is there a plant group with such versatility in adaptation." But how, you may ask, can one judge reasonable adaptability for these plants? Originally bromeliads were to be found only in an area bounded, roughly, by thirty degrees both north and south of the equator and from the Atlantic to the Pacific Ocean. Many bromeliads today are being imported from that area, but there are many obtainable from nurserymen here that are the result of many generations of growth in this country under conditions somewhat at variance with their place of origin or are perhaps the result of hybridization. It should be remembered, however, that although these plants are basically tropical and sub-tropical in origin, in the area mentioned, there are low coastal areas as well as mountainous regions and there are rain forests as well as dry spots. Since there is not sufficient literature available yet to designate which plants come from a certain area, it is often this factor that will explain a failure to develop good, healthy plants of a species or variety. For instance, certain plants do well in Florida but not so well, if at all, in California and vice versa. Sometimes a plant may be moved several times, each move giving it more or less light intensity or better air currents, and eventually a more agreeable position is found that immediately shows in an improvement in growth and the condition of the plant. A little research in the Handbook, an inquiry among Bromeliad Society members, or a contact with the source from which the plant was obtained will often be of great help in aiding the plant to adjust to such conditions as you may have to offer it. As stated before, bromeliads are adaptable, but this does not mean they will live and flourish under ridiculously abnormal conditions. Meet them half way, as it were, and they will respond wonderfully for you. Here are some of the ways you can work with bromeliads even under harsh conditions: Few bromeliads will grow and flourish in a steam-heated apartment, but some will do well if kept in a sunny window over the sink where frequent usage of the sink creates humidity in that particular area. They may be kept in a Wardian case placed near a sunny window and brought out occasionally for display as a table decoration. The same holds true for a fully air-conditioned home. If there is little movement of air in the house, the plants will suffer and should be kept for the larger part of the time in an airy place, such as an open porch. In this respect, bromeliads are somewhat like the Bonsai plants that are brought into the house only for special occasions. This means, especially for those growing bromeliads in more northern latitudes, that if more than one or two plants are acquired there must be a place prepared and provided where for most of the time they can enjoy currents of fresh air yet be protected from too much direct sun in summer and too much cold in winter-as a general rule, not below 45°F. The foregoing comments apply chiefly to those living north of the thirtieth latitudinal line. At the same time, though, those living in the tropical or sub-tropical zones would do well to keep these thoughts in mind. Basically, these plants need fresh air in motion, good light, and good humidity. Some will take full sun all day, even in Florida. Others cannot. Inquiry through proper channels will provide the necessary information on this matter. Humidity is essential to most bromeliads, though there are those that will grow on rocks in the full tropic sun. For those grown in pots there is some difference of opinion. Whether to let them dry out between waterings or to keep them constantly moist is a matter of debate, but a moist pot does aid in providing humidity around the plant as the moisture evaporates. Good drainage is essential, however, to insure the potting medium from never becoming soggy. The thoughts presented here are naturally but a preliminary to placing bromeliads on display. There must be a sort of "cradle to the grave" awareness if one is to show and grow good healthy plants with leaves that are "alive" and fresh looking, without blemish such as scale or scale markings—in other words, plants that you could exhibit at any garden show with the assurance that they would deserve a blue ribbon. So . . . next issue . . . something about cultivation, potting media, for bromeliads on display. The Bromeliad Society of South Florida participated in the Twelfth Annual Metropolitan Miami Flower Show held in April. The exhibit of bromeliads was very well received by the visitors, many of whom were quite excited by the variations in leaf color, inflorescence and form of the plants. A tree laden with a variety of plants and a ground cover of the most beautiful of the colored and variegated leaf types were indeed eye catching. We are grateful to those members who worked so hard to make the exhibit a success. Aechmea pineliana (Brong.) Baker var. minuta M. B. Foster, var. nov.
A var. pineliana omnibus partibus minoribus, seminibus paucis differt. Collected in Espirito Santo near Sta. Theresa, Brazil, in 1940 by M. B. Foster, #3052. Type in U. S. National Herbarium). This new variety of Aechmea pineliana collected twenty years ago, in open forests, has been a favorite for many collectors ever since we brought it back alive to compare with the original Ae. pineliana var. pineliana which had been in our collection for several years. The typical variety came over from Europe with some of the earliest bromeliads introduced into the U. S. A. The first time it was introduced into cultivation in Europe by Morel was about 1851. The first botanical description of it was published in Hortus Donatensis in 1854 when it received its first name, Echinostachys pineliana Brong. ex Planchon, possibly in honor of Dr. Pinel, consul in Rio de Janeiro at the time. Beer named it Echinostachys rosea in 1857, Lemaire called it Macrochordium pinelianum in 1862. Seventeen years later, in 1879, Baker placed it in the genus Aechmea where, ever since, it has rightfully remained under its present name. The new variety, minuta, is much more attractive, both in color and form, than its prototype. Also, because of its miniature size it is more suitable as a house plant. Naturalized outside in Florida, it has stood a temperature as low as 25°; it thrives best in good partially filtered light. NEXT MONTH: We enter 1962 with one of the most popular of all the genera, the Aechmea, leading the procession. A special article entitled Why Aechmea? will tell the reasons why this genus is the one that everyone should grow. All those Aechmeas listed in American catalogues will be discussed and their special requirements given. There will be, of course, other articles of unusual interest, but we won't comment on them at this time. Be sure to receive this splendid issue by renewing your membership now. I have grown this little Aechmea with equal success both in the greenhouse and in the sunny rockery with various succulents. I live in the coastal area of southern California, where it is never exceedingly hot and where it very seldom falls below 38°. In the greenhouse the leaves of this diminutive Aechmea are a sparkling greenish silver! Outdoors they are a striking rose with a hint of silver. The leaves are edged with prominent maroon-colored teeth. The plant is a shy bloomer for me, but this little gem needs no flower to make it desirable. The flower head is an interesting one, though, resembling a small pine cone perched on a red scape. The flowers are yellow. The rosette in my garden is more flattened than shown in the illustration. It is usually almost perfect in form and is never more than a foot in diameter. The leaves at their widest part do not measure over one inch. Despite the fact that the plants outdoors are sometimes neglected, they are always in splendid condition, with no burning or brown tips. The regular variety of Ae. pineliana is for me a fussier grower, although it, too, is an attractive plant with its silver overtones. Both varieties sucker freely. It would seem, however, that this Aechmea is a variable species. Others who grow it in southern California find that it needs more care and more moisture. Those plants which I have seen growing in a greenhouse in an inland valley tended to be larger and less compact than mine. Our felicitations go to our valued member and trustee, Charles Lankester of Costa Rica, who this last June received from Queen Elizabeth II the insignia of Gentleman of the Order of the British Empire. This honor was given to him in recognition of his long and fruitful career as one of the leading horticulturists in Central America and for the cordial contact which he has maintained between British residents and the native Costa Ricans. Don Carlos has lived for over half a century, in Costa Rica, not only owning one of the largest coffee plantations in the country, but possessing one of the largest collections of orchids and bromeliads in Central America. Many of us were deeply grieved to hear of the death of one of our most loyal and enthusiastic members. Charles Webb of Sydney, Australia. One of the pioneer bromeliad growers of his country, he did much to make others interested in this rare exotic. He raised many of his plants from seed and always shared his surplus seedlings with others. His garden was a small one, but it was crowded with beautiful plants. His glasshouse was so packed that at one time he wrote that he had sought in vain for a space to put one more 4" pot. Charles Webb was a delightful letter writer and held a large correspondence with many members in the United States. His cheerful, refreshing letters and his never-failing sense of humor will be missed by all of us who regularly heard from him. Deeply missed will be another good member of the Society, Mrs. Fern Lawrence of St. Petersburg, who also died this year. She was very active in the affairs of the Florida West Coast Bromeliad Society and held a number of offices. With this issue the Bromeliad Society completes its eleventh year as an international organization. During its first decade of existence the progress of the Society was a slow but steady one. 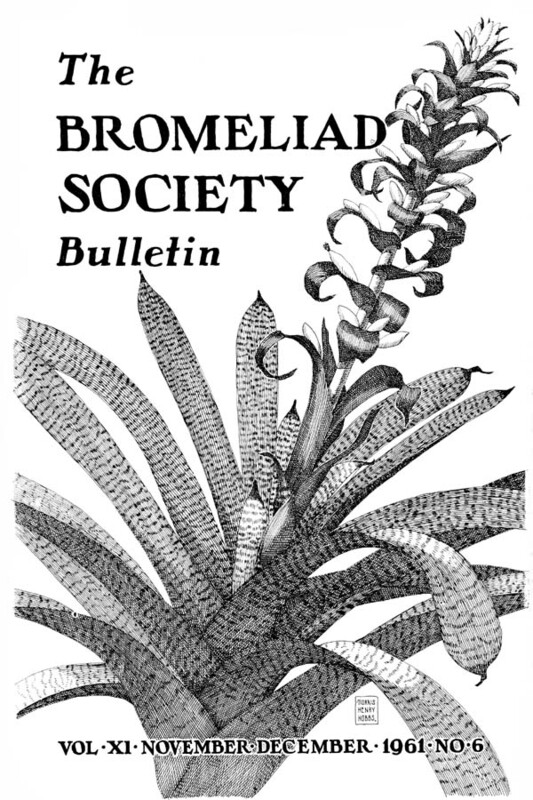 But suddenly, in 1961, the public's interest in bromeliads was aroused (partly through the active campaigning on the part of many of our members), and the Society roll reached a height it had never before attained. From all parts of the free world have come new members, so that at the present we have more than 500 members with more coming in each day We now have four affiliated societies and will probably have several more before the year is out. Any one who is interested in forming a local group is invited to write the secretary for details. The editor was very much gratified with the response received from the questionnaire that was circulated this summer. Needless to say, she received many ideas that will be used in the Bulletin, and a complete resume of her findings will be published at a later date. A common complaint is that the Bulletin is geared to the expert rather than to the beginner. This is the only magazine in the world devoted exclusively to the bromeliads, so it is imperative that all important botanic findings be recorded if justice is to be done to this great family of plants. In future issues, though, the novice will be considered, and a special series of articles on the various genera is in preparation. 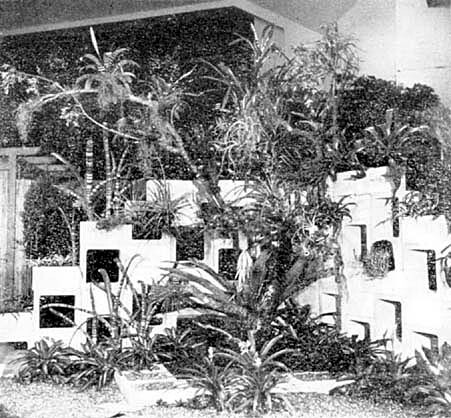 During 1962, too, in accordance with popular demand, there will appear in each issue a description of a noteworthy garden, from which many ideas on how to grow bromeliads can be derived. The dominant plea seems to be, however, for a bigger bulletin and for colored illustrations. If the Society continues to grow as it has during the past year and if all the members renew their subscription, a bulletin the size of this (four extra pages) can be maintained. The affiliated society in Southern California has long championed the cause of a colored illustration in each issue and will underwrite the cost of several for 1962. If any other affiliate or independent member would like to donate a colored illustration, his assistance would be appreciated by all who read the Bulletin. But all our ideas for a larger bulletin with more illustrations will amount to nothing unless we have the cooperation of the entire membership. Please let us know that you are behind our endeavors by sending in your subscription for 1962 immediately to the membership secretary, Mrs. Jeanne Woodbury, 1811 Edgecliffe Drive, Los Angeles 26, California. (Annual dues are $3.50; Sustaining, $5.00; Fellowship $10; Life, $150; Foreign, $4.) As no society can exist just on its annual dues, sustaining or fellowship members are earnestly solicited to help meet the increased publication costs. We also need ideas, comments, photographs, growing hints, accounts of trips, descriptions of gardens and plants, etc., from our members. We need some new authors; we know that there are many who have challenging ideas that will stir the readers. But we do thank our old standbys — the Fosters, Dr. Lyman B. Smith, and others without whose help we would have no publication. We are deeply grateful, also to Morris Henry Hobbs, whose superb drawings have made each cover a piece of art and our bulletin truly distinctive. Sometimes something may go a little wrong with the full progress of the meiotic division; and although the nucleic materials may migrate normally to the poles (terminus of the spindle fibers are called poles), the nucleus does not finish division, and the cell so produced, even though it is destined to be a reproductive cell, has twice the normal chromosomes because the nucleus instead of separating into two nuclei does not separate and both chromosome complements end up in the same nucleus. Meiosis has a second phase which is a second division of the nuclei with reduced chromosome number. This second division is typically mitotic in nature and each of the chromosomes divides longitudinally so that each of the four nuclei derived from this second division are like the cells derived from the meiotic division and are haploid. In the rare aberrant case where the first division was interrupted and a diploid second stage resulted, the four cells derived in the second division are also diploid in chromosome number rather than the haploid number typical of gametes (reproductive cells). If a haploid gamete fertilizes a haploid gamete (that is haploid pollen cell with haploid ovule) the zygote (fertilized egg) is made up of a half a chromosome set from each parent and forms therefore a diploid zygote and the individual derived is normal. However, if through some aberration in gamete formation the pollen is diploid (instead of haploid) and it pollenates and fertilizes a normal haploid ovule, the derived zygote will have one chromosome set from one parent and two chromosome sets from the other yielding what are termed triploids. By the same token, a diploid gamete fertilizing a diploid gamete will produce a tetraploid. Tetraploids can produce diploid gametes and if again aberrant might also produce tetraploid gametes. By way of these abnormal gametes, pentaploids and hexaploids are produced. All of these higher chromosome numbers are classified under the general heading of polyploids. All of these conditions, and more, occur in nature. The existence of polyploids present special problems in cell division and in hybridization. A normal diploid had two of each chromosome and in meiosis one of each migrates to the new nucleus. A tetraploid has four of each chromosome and two migrate to each pole. However, in triploids there is difficulty in the equal division of three of each chromosome and triploids for this reason are infamously poor producers of functional gametes (egg cells and pollen cells). Triploid orchids are frequently known for their quality and equally well known as being relatively poor stud plants. If, in some rare cases, triploids do produce some viable gametes, they may have one or two sets of chromosomes, or quite possibly one set and a fraction of a second which if present as one chromosome extra is said to have a univalent, or if two it is said to have bivalents. The presence of these fractional sets of chromosomes produce still greater irregularities in cell division and these irregularities may be of such magnitude as to prevent adequate cell divisions and in such cases when they result in the death of the cells or zygote they are called lethals. Polyploidy, as this duplication above the normal of chromosome materials is termed, has other interesting consequences. Within limits, higher than normal chromosome numbers may favorably improve leaf and flower substance, increase plant stature, increase vigor. However, not infrequently the higher polyploids become dwarfed, wizened, distorted, and less vigorous. The degree of polyploidy in the Bromeliaceae (or any plant), if presented at all, can only be determined by microscopic and cytologic examination; it cannot be deduced from outward expressions of plant growth or habit. The chromosomes, as pointed out earlier, are composed of myriad discrete chemical materials which although far from fully understood are known to govern all of the functions and differential development of tissues of the plant, which in total effect is the plant we know and grow. These discrete materials are termed genes. Each gene or group of genes controls or influences some particular function or characteristic. When the expression is controlled by a group of genes we refer to the condition as "factor interaction". The genes are arranged in linear fashion on the chromosomes, and it is not only the gene itself or group of genes but the order in which they occur which is the determinant. If, on our pair of homologous chromosomes, each pair of adjacent genes is identical, then no matter into which half of the new nucleus either chromosome goes in the meiotic division each of the cells produced will be identical with the other. In this case all gametes so produced will be the same and the plant will breed true; all progeny will be the same in all respects (under conditions of self fertilization) and is said to be homozygous: However, if there are any differences between any of the genes on any of the pairs, or in their arrangement in linear series, the individual plant will produce dissimilar gametes, will not breed true to type on self pollination, and is said to be heterozygous. For illustration, let us suppose a case where comparable genes on a chromosome pair influence the pattern or lack of pattern on the foliage of our plant. Let us hypothesize that one chromosome has a gene for barred foliage which is recessive and on the homologous chromosome the comparable gene for non-barred foliage is dominant. In this plant, as we see it, the dominant will appear to us as non-barred foliage and we will not be aware of the recessive gene due to masking of it by the dominant. This plant if it flowers will produce gametes some of which will have only the gene for non-barred foliage while others will have only genes for barred foliage. The fertilization involving any gamete with a gene for non-barred foliage, it being a dominant, will mask any gamete having the gene for barred foliage, but should the fertilization be between two gametes having the recessive for barred foliage then the progeny will express this barred foliage characteristic. This sort of expression of the genes introduces two new terms. The plant that we see is the visual expression of some of the genes (but not necessarily all the genes) and is the phenotype. The actual presence of genes visibly expressed and not expressed (which contains potential for later expression) is the genotype. In plant breeding work we are trying to combine gene traits that we see in the parental types selected. We are often confounded by the appearance in the progeny of traits that we did not see at all in either parental type or the loss of some desirable character. Genes are not always either dominant or recessive; they may also be intermediate in their influence. Many are familiar with the records Mr. Foster has offered on the breeding behaviour of the clone of Ae chantinii which is apparently self-sterile. This clone of Ae. chantinii does produce some viable gametes, as there are bi-generic and interspecific hybrids on record. In no case, however is the barred foliage, which is so desirable in Ae chantinii expressed in the progeny (first generation of F1 progeny). However the genes which produce the barred foliage effect in Ae. chantinii are there in the progeny, and were it possible to find self-fertile F1 progeny it would not be unreasonable to hope for the reappearance of this trait in an F2 generation produced from the self-pollination of the unbarred F1. This is a hypothetical case, of course, as I do not believe that there are any fertile F1 generations with this clone of Ae. chantinii involved. The lack of evidence does not of necessity refute the possibility. As expressed above, it is not to be assumed that the genes are either dominant or recessive, for they may be mutually assertive and the F1 progeny may be intermediate between parental types. It must be remembered that there are uncountable genes present on the chromosomes, some of which may be dominant, some recessive, others intermediate, and others may be expressed only when in combination in certain arrangements with other genes, or they may be expressed only when in the presence of other genes on other chromosomes. Chromosomes, just as the normal division processes of the cells may suffer abnormal patterns in development, may also be modified in the due course of cell division. As the chromosomes shorten and thicken and align themselves with their homologues, they may cross over one another and break at the area of crossing, rejoining the fragments from one chromosome on another. Chromosomes unlike those found in either parental cell may appear in such a way. A modification in the sequence of the genes can occur if there are but a loop in a single chromosome with the fracture coming at the point where the loop crossed itself with a consequent realignment of the genes. And there may be new combinations where homologous and heterozygous chromosomes cross over each other break and rejoin. There can also be the crossing over and translocation of chromosomes parts of non homologous pairs in which case genes will be in combination with other genes with which they were previously related only insomuch as they were in the same cell. These resulting new combinations may produce inferior or superior performance characteristics, and the progeny may succeed or succumb accordingly. Further, in the crossing over of chromosomes there is always the possibility that one chromosome may end up with two spindle attachments and another none. In the division of such a cell the chromosome without spindle attachment could not migrate to either pole and might be lost or appear only as a stray fragment. The loss or adventitious gain of such a fragment may be lethal or have other abnormal effects. The formation of lethals is probably the more typical effect in cases of such a loss. The accumulation of variations induced by any of these means results in a varied array of botanical forms, and we at our time in earth history find ourselves with a collection of taxonomic entities which have evolved and which are still evolving. We as botanists and horticulturists try to describe, understand, and grow these plants. As part of our horticultural efforts we pollinate to produce seed for the more rapid production of our plants and cross pollinate to produce new hybrid forms and scientifically to understand taxonomic relationships. In this evolutionary process all of these processes occur. Modifications in genic structures are generally included under the heading of mutations and hybridizations. Selection and isolation perform their own parts of this matter of differentiation of particular taxonomic forms. Mutations are of a variety of natures and may be what are called "point changes" . . . that is an actual chemical modification of a specific gene or group of genes which under natural conditions may be induced by cosmic rays, or under artificial stimulus may result from high temperatures, various chemicals (colchicine), X-Ray, etc., and are novel in that they did not appear in the genic makeup period to their creation. They may be suppressed in the phenotype, resting undetectable in the genotype until some breeding factor or reassortment has removed other possibly inhibiting genic influences, or they may appear immediately in the next generation phenotype. They can perhaps be lethal and may never appear at all. The expression of the latter may be a simple matter of low percentage germination of seed. The lethal influence may be early enough to destroy either gamete or zygote (fertilized ovule) and there might simply be reduced seed production. The presence of such modifications in the genes may lessen resistance to climate or limit the flexibility for adjustment to changing environmental conditions, reduce vigor in some manner, or, on the other hand, the effects may be quite the opposite and serve advantageously in many such ways. Mutations are not always "point changes" and may fall in that wide category of chromosomal inversions, segmental interchanges and translocations briefly described above. They may be losses or duplications of whole chromosome complements or duplications of only fragments and the consequent partial polyploidy. Mutations and hybridization, both within a species and between species, result in new combinations of genetic materials. Hybridization tends to increase variability by providing new combinations of chromosomal materials and by the breaking down of broad distinctions which serve to define different populations, uniting apparently dissimilar groups into a larger single population which grades from the extremes of both groups. Hybridization between species which results in a sterile F1 may result in an entirely new species if it should be followed by polyploidy of the sterile F1 which may both increase the barrier between the parental types and provide for the fertility of the progeny of an otherwise sterile cross. Selection and isolation may be thought of as equalifying factors which affect populations but which of themselves do not provide new genic constituents. Selection promotes population differentiation through differential survival of varying types within the limits imposed by the varying genotypes. If a single species were to extend over a thousand miles of geography (Billbergia amoena and its many varieties might be such an example, or Tillandsia usneioides, etc., etc.) the extremes of that continuous population (or segments of it) are probably existing under different ecological conditions, and in each environment differing forms (permissible within the plasticity of the genetic nature) could survive exaggerating the dissimilarities of relatively homozygous or homogenous population which might not at all resemble other segments of the same population. If intermediate forms of this population were removed by some force of nature, these extremes of the population might be varietal in status, or if the accumulated differences were great enough they might be of specific level, taxonomically. Diversity of form is described in terms of the observable differences (phenotypes) between varieties within a species, between species within a genus. These differences accumulate from mutations of the many kinds, and hybridization and the workings of selection and isolation, but from a once common genotype, and within the limitations imposed by the genic make-up. 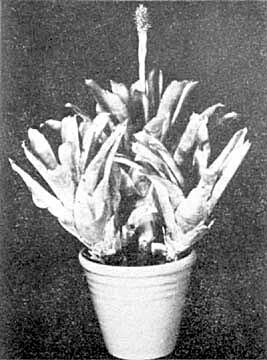 One is reminded of Mr. Foster's advice to be certain that variability is no more than a response to environment rather than inherent genetic differences when he says that one should gather together all the forms of a given plant and grow them for extended periods of time under identical conditions and then draw conclusions. Some cases, the observer is cautioned, may be cultural or environment problems rather than genetic or taxonomic problems. Each species, if so far evolved as to carry a certain specific pattern of genes, is usually of such a nature as to have some barrier to inter-breeding, under natural conditions. However, some species and even some genera occasionally will cross in nature to produce inter-specific or inter-generic hybrids. This may be interpreted as indicating a commonness of ancestry. 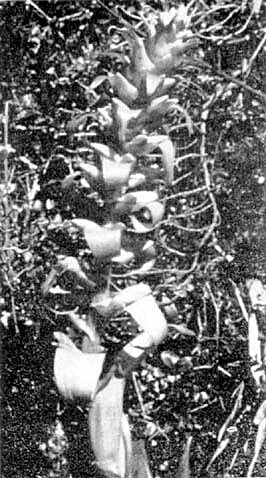 There is evidence in the Orchidaceae and in the Bromeliaceae to this effect unless one is to conclude that the taxonomists have long been "all wet". Species populations are not homogenous genetically, and they exhibit, therefore, certain variability in most cases. Note references to Billbergia amoena and its many varieties over a wide territory and the many forms of Tillandsia fasciculata. The suppression (or loss through differential survival) of some forms provides the plant breeder with many problems which have been resolved by orchidists by the arbitrary assignment of varietal status to each outstanding form within horticulturally important species. The many named varieties of Cattleya trianae might be cited as an example. Where fertile hybrids result between closely related species, the progeny in the F1 are typically intermediate, though not identical; and the selfing of this F1 typically yields an enormously variable F2. Seldom, if ever, are two of the individuals alike, and none is identical to either parent or to the F1. A large part of this progeny will carry various recombinations of the parental characteristics and may be arbitrarily lumped as intermediates, and whereas, some individuals may carry distinct traits particular to one parent or the other, none can be mistaken for either parent or the other. It is highly possible that some or even many of this F2 progeny may possess characteristics not represented in either parent. These new phenotypes owe their formation and appearance to novel combinations of the ancestral genes, possibly present as recessive or as a result of genic inter-actions, or through chromosomal inversions and translocations. When one refers to a species he believes he knows what he means, so fundamental is the species concept to our biologic thinking, but, at best, the species is a serious problem. Genetic and taxonomic students are not necessarily in accord. Taxonomists are varyingly referred to as "lumpers" or "splitters" dependent upon how conservative or how liberal they may be on bestowing new names. Denial of natural variability within a species can seriously impair the picture by the indiscriminate naming of each variant, thereby making each genus unwieldy and over definitive to the point that none but the described plant fits . . . and on the other hand, over acceptance of this natural variability within a species can compound the picture also by the inclusion of too greatly dissimilar types within single species.